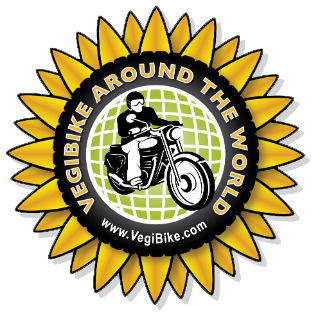 VegiBike, veg oil and diesel fueled engine, classic Royal Enfield motorbike by Harry Lyon-Smith: Patagonia, roads from heaven and hell. Patagonia, roads from heaven and hell. What a change of pace. Having enjoyed a few nights camping, my next stop was with my old Devonian friend, Binny, and her family at the farm they escape to from Santiago for a month or so around February time. With faultless instructions I found myself driving down a private road a few miles before finding the house right on a gorgeous lake and in immaculately kept grounds. It was so good to see Binny and her husband John Paul, along with other members of his family. To top it all the bonus came in the ever delightful guise of Binny's mother, D. She was flying in the next day on her annual visit, along with a couple of her grandchildren returning from English schools for half term. Everyone I've met, and certainly mentioned in this blog, will hopefully be friends from now on. However there is something very special about home friends. The conversation is not about getting to know one another, but about family and friends, common memories, future hopes and feelings etc. So thank you Bin for topping up those particular tanks. I was royally look after, not only in the mouthwatering victuals, perma-glass in hand, very comfortable bedroom, saying nothing of the great company. How did I repay these giving hands? I broke the only ignition key of their car, rendering it immovable an hour's walk from the house. Of course it wasn't intentional, it happened because we had had a puncture and to get the spare tyre out, involved unlocking it. Unfortunately the lock did not want to yield, and after half an hour of jiggling to try and free it, my turn came along to have a go, and I promptly snapped the key. A very red-faced moment generously brushed aside by my hosts. I saw nothing of the great efforts to remedy the situation, but I do know that somehow a spare key was sent down from Santiago and the car was back home a couple of days later. After a couple of days of this heaven, it was off to Argentina to meet Hugh the half brother of a good friend (Lawrence), and his wife Jessica who lives just outside Bariloche at the northern part of Patagonia. It is high season in this part of the world, with school• holidays almost three months long!! I naïvely thought that finding a hotel in the fashionable town of San Martin de los Andes would not be a problem, even at 10 o'clock at night when I arrived having encountered various ferries and drawn-out customs crossings etc. After a few hoteliers told me very clearly that there was no room with them or anywhere else in town, I resignedly accepted the camping option. However my blessed GPS had me going through the night on very rough tracks in search of campsites which were supposed to be only a few miles from the town. I guess I was tired and not thinking about what it was doing, and it took until 12 to get the tent up and the zip closed for the night. 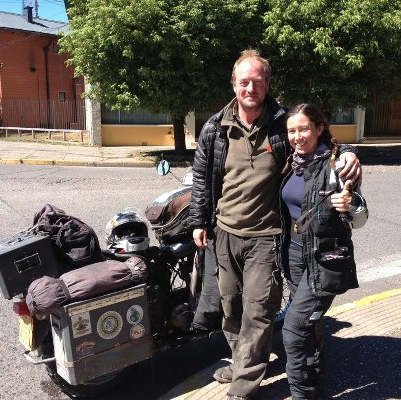 Hugh and Jessica have lived in Argentina for three years just as Victoria, their daughter, emerged into the world. Hugh had been feeding me many emails suggesting routes and sites to see and take on my way since we made contact in Ecuador, many of which I did. So not only was I very keen to thank him in person, but also meet them. I had little background, but knew the company would be very good knowing the other side of his family. For three days encyclopaedic knowledge of all matters South America were imparted, along with the extraordinary career Hugh has had fighting the corruption and malpractices in the micro-finance world. His recent book, "Confessions of a Microfinance Heretic", has rocked that industry, and although no one has countered any allegation, physical threats have been made. This has not stopped his campaign that damages and exposes a few banks and organisations like Kiva, but in turn hopefully saves many from the horrors of insane interest rates and ghastly consequences of failed repayment. Jessica's work with various woman's charities around the world are highly complimentary, what a team they make. He is also a biker, and has set and held the Guinness Book of Records for the fastest drive on a bike between the top of Alaska and the bottom of South America 12 years ago. Although there are claims to have bettered his 35 days, these were not done with the Guinness Book of Records strict rules about a daily routine of three signatures from authoritative and trackable persons, stating that they had indeed been at that spot on that day, along with photographs beside recognisable places, and of course not breaking any speed limits. We went on a tour around Baroloche. A large number of Germans lived in this part of the world, many apparently from the post-Nazi era. Many conspiracy theories abound, the most extraordinary being that Hitler did in fact end his days there, rather than in the bunker in Berlin. The basis of the story being that the charred remains of Hitler and Eva Braun, were never proved to be them. This may or may not be the case, but it does enrich the area from a touristic point of view. I had the pleasure of Hugh's company back over to Chile for my ride south. It was only going to be for a day or so before he had to catch a flight to Ecuador, where he works for one of the "good guy" banks in micro-finance. It was bucketing down with rain, and this less than ideal was promptly compounded by Batty's rear wheel bearing collapsing (after 20,000 miles) at the same time as the throttle clasp breaking in the most impossible to get at place. Of course we were miles from anywhere, but with some ingenuity we managed to get to a mechanic shop who allowed us to spend five hours stripping down the primary case etc and putting her to rights. It has constantly amaze me how often common parts are available around the world, and this bearing was the same as many used in Japanese cars, so what could have be a lengthy show-stopper in fact was managed within the day. Poor Hugh had to put up with greasy hands and a lost day while the strains of Batty's journey bubbled up. The next day Hugh zoomed off on his Africa Twin to do his work, and I carried on down what must be one of the most beautiful roads in the world, the Carretera Astral. A road framed by snowcapped mountains, milky blue rivers, lakes, and forest. This road is just plainly called number seven on the map, but it runs all the way through Chilean Patagonia. Alas I had to cut across back into Argentina halfway down as it runs out before the bottom of the continent. I have elected not to go to Ushuaia, which is the southernmost town that one can drive to, but to Puerto Natales, a port a few hundred miles north that has a ferry service that connects to Puerto Montt, halfway up Chile, over four days. Apparently the last few hundred miles are relatively less inspiring and I have concluded that my medium is "around", not "up and down". We went up to see the captain, poor chap has to put up with an awful view from the office window. As Hugh had suggested, the road would be a mecca for other motorcyclists, and along the way and particularly at the various ferry crossings and takes as the road is joined up between the Lakes and fjords. Many delightful guys from Chile, Luis, Daniel and Manuel, and also another Luis from Portugal. A large team of Argentinian riders also helped swell the ranks. But much more than motorcyclists, it was the much greater number of bicyclists and hitchhiking backpackers that really stood out. Although some of the road is asphalt, majority is gravel. Batty does not have a great relationship with gravel and although we struggle along, it is all consuming concentration wise and on more occasions than one I heard myself saying "going going going" but for Batty to find her feet at the very last moment before calamity. I am always amazed when other bikes roar past me doing twice the speed, I guess their bikes are more set up before this sort of surface, but I think it's as much to do with the confidence of the rider as anything else. Back in Argentina for the final push south one gets onto the Ruta 40, which is famed in Argentina for running the whole length of the country. Again this was a lot of gravel, although the promise of asphalt all the way in two years time may be a horror for some, but to me it would be a blessing. I was a day behind due to the problems with the throttle cable and the rear wheel bearing, so I missed out another prize along the way in the form of El Chaltein. It is a world climbing destination, but will have to wait for another time. A great joy along the way, was having stopped for the night at a very remote spot called Bajo Caracoles, where a simple room costs the equivalent of about £40 where anywhere else in Argentina would be less than half that, two motorcyclists rolled into view. It was Gordon and Ben, who had driven like the wind from Santiago in three or four days in a desperate bid to get to Ushuaia, and then back to the same ferry that I'm taking, giving them just four more days. We dined heavily on beer and wine. Somehow the next morning they were away at an early hour. I carried on down to a place called Cafayate, where one can go and see the famous glacier, Perito Moreno. It is amazing and had the sun been shining and not rained all day it would have been all the more so. Hi Harry, nice update, Patagonia looks very neat, great photo of you on horseback, the glacier looks fab. Best wishes to you from Mark Abraham. PS Spoke to Charles Haydon yesterday, he wondered if you had at any time during the trip regretted choosing your diesel engine? Excellent update Harry. It well and truly cheered up my Monday blues during my lunch hour. Looking forward to reunion beers on your return to London.